58 percent of voters strongly or somewhat support more regulation and oversight of large banks. A 41 percent plurality of Republicans said the same. Large banks trail only health insurance companies for voters who said there is not enough regulation of the industry. Democrats are expected to take a sharper anti-Wall Street tone in the next two years as the party begins to shape its 2020 messaging. Analysts and political strategists said that could be a compelling move, with regulation and oversight of large banks popular among both Democratic and Republican voters, according to a recent Morning Consult/Politico survey. 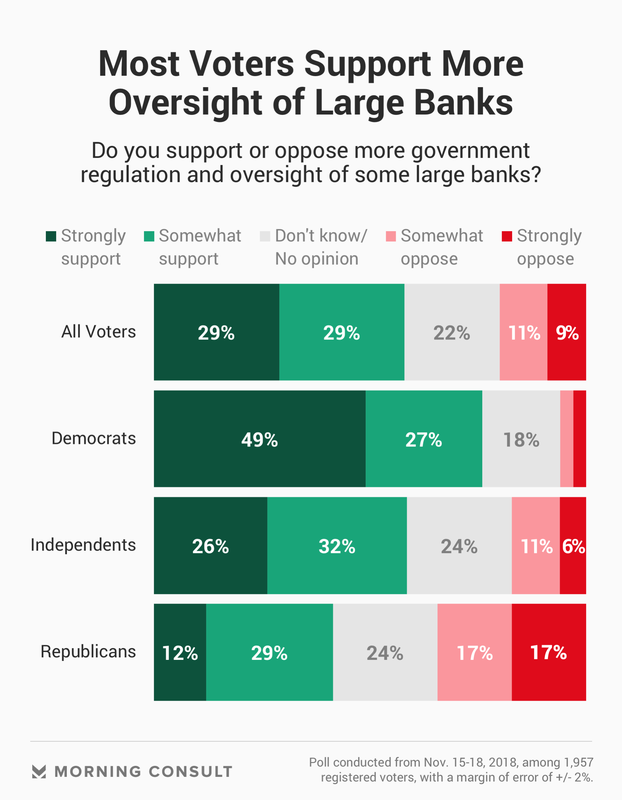 Fifty-eight percent of registered voters in the poll strongly or somewhat support more government regulation and oversight of some large banks. The Nov. 15-18 survey of 1,957 voters, which has a margin of error of 2 percentage points, found that 20 percent of voters said they either somewhat or strongly opposed additional oversight, while 22 percent did not know or had no opinion. Democratic voters largely drove support for more regulation and oversight, with 76 percent saying they would support increased supervision, compared to a 41 percent plurality of Republicans said the same. Thirty-four percent of GOP voters oppose such measures. Rep. Maxine Waters (D-Calif.) has indicated that she will set a more strict oversight agenda on large banks when she takes control of the House Financial Services Committee in January. That would include opposing deregulation measures — as well as calling in the executives of some large banks such as Wells Fargo & Co., the subject of a series of sales-related scandals, and Deutsche Bank AG, which has come under fire for its close relationship with President Donald Trump, to testify in front of the committee. “Make no mistake, come January in this committee, the days of this committee weakening regulations and putting our economy once again at risk of another financial crisis will come to an end,” Waters said at a Nov. 14 hearing with Federal Reserve Vice Chairman for Supervision Randal Quarles. While experts say it’s unlikely that Waters and the House Financial Services Committee can get any significant legislation through the Republican-controlled Senate and past Trump’s desk, they still expect “fireworks” in the panel for the next two years. Democratic strategists are banking on this agenda playing well with voters. Many Americans want more regulation of large banks — even when compared to other industries and companies. A 47 percent plurality of voters said there is not enough regulation of large banks, compared to 25 percent who said there is about the right amount and 10 percent who said there is too much. Large banks trailed only health insurance companies — at 49 percent — in the share of voters who said there is not enough regulation on the industry. Within the financial industry, insurance companies came next at 44 percent, followed by Wall Street at 40 percent. Banking will be a more divisive issue among Democrats in the lead-up to the 2020 presidential election, said Ed Mills, a Washington policy analyst at Raymond James Financial Services Inc.
“Any Democrat who wants to capture the nomination in 2020 cannot be seen as close to the banking industry,” he said. Anti-Wall Street rhetoric has helped propel candidates on the Democratic ticket onto the national stage before: Sen. Elizabeth Warren (D-Mass.) and Vermont’s Sen. Bernie Sanders both earned their bona fides as bank and Wall Street critics, Mills noted.